In Part 2 of my Computer Desk / DIY Desk PC build series, I'll show you how to finish your custom DIY gaming computer desk or desk PC. This desk could be built with a circular saw, jigsaw, and drill, so it's a great project for relative woodworking beginners! Also, if you missed Part 1, make sure to check it out here before moving on! I have Desk PC plans available, if you'd like to build this exact desk for yourself. The plans include a detailed cutlist, cutting diagram for breaking down the sheet goods, and a SketchUp file. To purchase plans, click the image above. 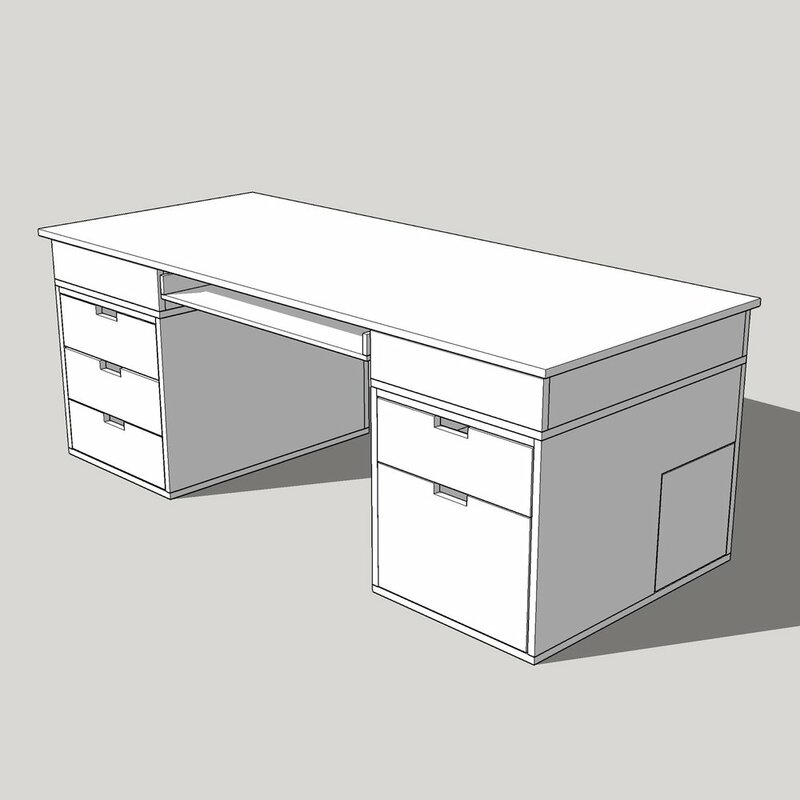 The drawers for the computer desk are made of ½” plywood for the sides and ¼” plywood for the drawer bottoms. I used the same technique I used for assembling the drawers in the CNC tool cabinet build, the steps of which are as follows: first, I cut the drawer bottoms to size. As long as I cut the bottoms square, the rest of the drawer should follow suit. 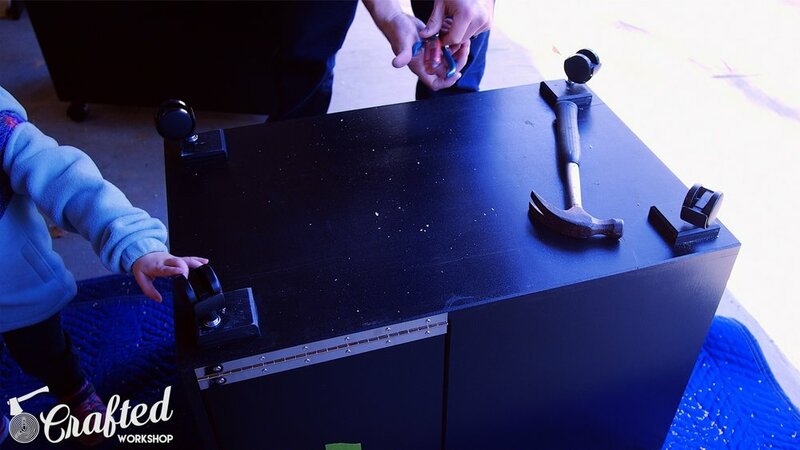 After cutting the drawer bottoms, I started assembling the drawers with brad nails and glue. I laid a bead of glue on the bottom, placed the drawer sides onto the bottom, and used a few brad nails to tack the sides together. I worked around the drawer and attached all of the sides to each other, then flipped the drawer over and tacked the bottom on, again with brad nails. Once everything was held together, I went back and reinforced all of the corners and the drawer bottom with 1 ¼” screws. Make sure to pre-drill and countersink your holes if you’re using plywood this thin, it is extremely prone to splitting when screwing into the end grain. I continued assembling the rest of the drawers then moved onto cutting the handles into the drawer fronts. 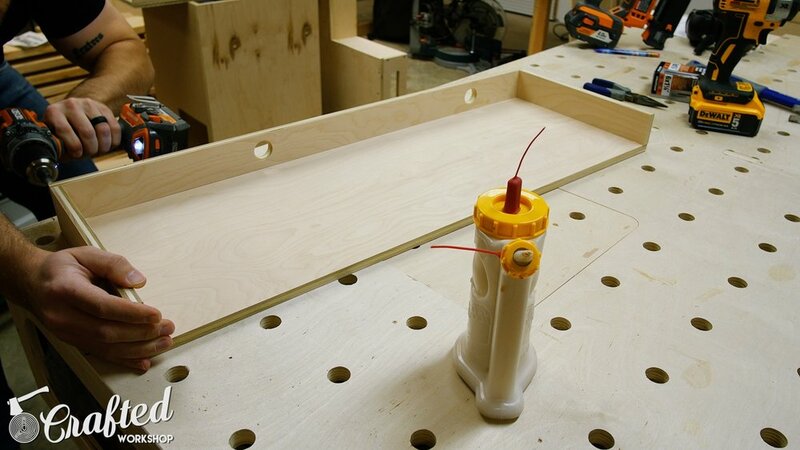 I made a quick template out of a scrap piece of ½” plywood, used double stick tape to attach the template to the drawer front, and then used a template bit on the router table to cut the handle into the drawer front. 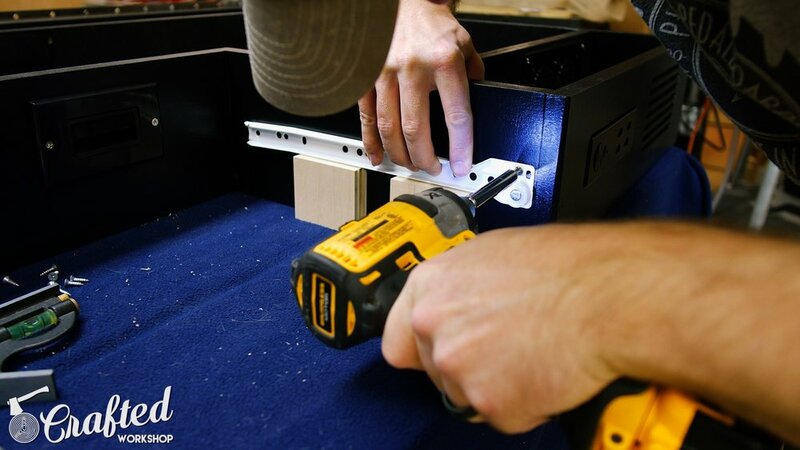 This method ensures that every drawer will have an identical pull cut into it and goes much quicker than trying to cut the pull into each drawer individually. Next, I built the keyboard tray, which is essentially a drawer without a front. The keyboard tray is made out of ½” plywood, and I drilled two holes into the back to allow the cables for the keyboard and mouse to pass through into the midsection. I also rounded over the holes with an ⅛” radius roundover bit, just to make sure they didn’t snag the cables. I also rounded over the front edge of the keyboard tray. With the drawers and keyboard tray assembled, I moved on to working on the top. The top is connected with two 30” piano hinges, and I have links to these and all of the other hardware for this build at the top of this post. Once I made sure the top fit correctly, I chamfered all of the edges on the top, including the top and bottom. Plywood has a tendency to delaminate at the corners, since the veneers can get knocked and peel up. Adding a chamfer really helps with this, and also gives the top a nice look and feel. Next, I installed all of the drawer slides into the cabinet carcasses. It is a lot easier to do this prior to finishing, as any errors you might make can be covered up during painting. I used inexpensive bottom mount drawer slides, which I have links to in the video description, and they install really easily. I always cut these spacers from scrap pieces of plywood, and they help to make sure the slides go in level. Once the drawers were installed, I installed the drawer fronts. As you can see, I also added a chamfer to all of the edges of the drawer fronts. Again, this will help with wear and tear, and it also looks nice. To install the drawer fronts, I used the playing card trick to end up with an even reveal around all of the edges of the drawer fronts. After spacing them properly, I used spring clamps to hold them in place while attaching them with screws from the inside of the drawer. The final touch on the cabinets were these spacer blocks, which I cut from scrap pieces of plywood. The casters I used needed 1 1/2” inches of depth for mounting, so adding these spacers gave me that depth. I glued and brad nailed them into place. Next, I needed to give the midsection and cabinets some way to stay aligned while still allowing the pieces to be separated for moving the desk. I came up with the idea to use biscuits, and this worked great. I put two biscuits in the front of the midsection and cabinet, and then cut three more biscuit slots along the outside edge. These two biscuit locations keep the biscuits aligned in both directions, since biscuits have a little bit of slop built in. I could have also used dowels here, but I was afraid they might be a little tight, making it difficult to get the midsection and cabinets apart. Once I had all of the biscuits cut and test fit, I glued the bottom half of the biscuit into the cabinet carcasses and left the top half without glue. After getting all of the hardware installed, it was time to prep for finish. I started by sanding everything flush between the midsection and cabinets, starting with 80 grit and working my way up to 180 grit. Next, I filled any screw holes, voids, or other imperfections with Minwax High Performance Wood Filler, which I will never use again. The fumes from this were horrible, and I had to air out my garage for a few hours to get rid of the smell. I’ve seen joint compound used for this same purpose, and it has almost no smell comparatively. With any imperfections filled, I sanded every surface of the desk, working my way up to 180 grit. This took a really long time, as there is a LOT of surface area on this desk. One nice benefit of using Purebond hardwood plywood is that is required a lot less sanding and surface prep than something like sheathing grade plywood. Purebond is the sponsor of this video, and I use their plywood for any of my indoor plywood projects. Purebond is made in North America, uses formaldehyde free glue, and is great quality. To learn more about Purebond, click here. With all of the surfaces sanded and wiped down to remove any dust, it was time for paint. I used General Finishes Lamp Black Milk Paint, and first attempted to spray it. I used an Earlex HV5500 HVLP system with a 2 mm tip and could not get the paint to spray well, no matter how much I thinned it. I have no idea what the issue was, but painting this desk was an incredibly frustrating process. After trying to spray the finish for about half an hour and not being able to get even one serviceable coat onto the top, I moved onto painting the desk by hand. For some idiotic reason, I thought using a roller wouldn’t leave a nice enough surface finish, so I painted the entire desk by hand with a brush, with the help of my incredibly patient wife. We spent seven straight hours applying two coats of paint, sanding in between coats. I also made the mistake of trying to paint the inside of the cabinets as well as the inside of the desk, which was completely unnecessary and time consuming. If you’re hand painting this desk, use a roller and tape off the inside of the cabinets and desk. Believe me. After applying paint, I sprayed three coats of General Finishes High Performance water based polyurethane over the paint, sanding with 320 grit in between coats. As you can see in this clip, this is the type of flow I’m looking for from my HVLP. A nice, even, wet coat. One other thing: I’ve noticed High Performance goes on and looks a little rough, but it self levels incredibly well. The surface was glass smooth after it dried, save for a few dust nibs, which seem unavoidable without a dedicated spray booth. Once the clear coat dried, I reinstalled the hardware. I also forgot to show installing this piano hinge for the subwoofer access panel prior to finishing, but it was pretty simple. To keep the door closed, I installed a sliding barrel bolt. Next, I installed all of the electronics into the midsection. First, I installed the fans, which I couldn’t have done without one of the 90 degree impact driver attachments. Next, I installed one of the USB charging ports into the front of the midsection. After that, I needed to install this power button and USB hub, and I used the card trick again for even spacing. The next pieces of hardware were the cable pass through brush plates. There were 5 of these, and they were really simple to install. I just screwed them right into the midsection. 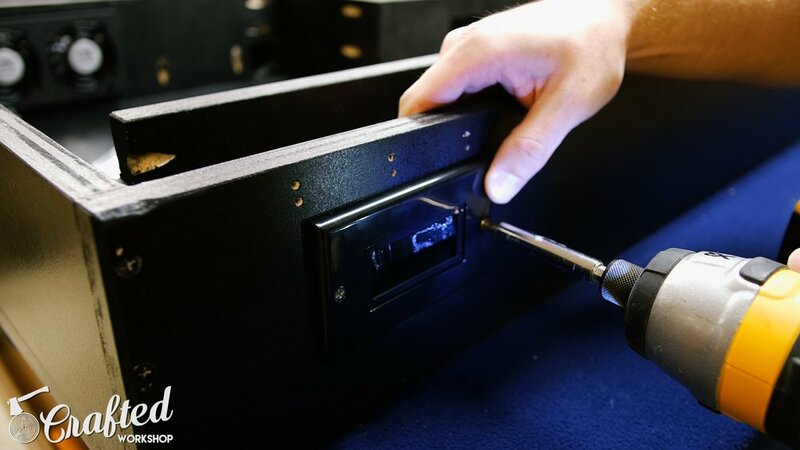 A lot of these pieces are designed to fit right onto a computer case or outlet, so you might need to get creative with your screws, since you won’t be able to use the ones that are included with the hardware. I just used the same screws I used to install the drawer slides and they worked out well. Next, I installed the 12” drawer slide for the keyboard tray, again using the spacer blocks to keep it level. I added the piano hinges to the back of the top, and then it was time to install the gas lift struts. These were a real pain to install, and I didn’t get most of it on camera because I had no idea what I was doing. I did have to cut this 1 ½” square notch out of the divider, which is reflected in the SketchUp file that comes with the plans for this desk. I also have links to the exact struts I used in the video description. I had to mess around with the placement of the brackets a few times but eventually got it working. The final step in the build was to install the casters. These are pressure fit. First, I drilled the holes for the casters to mount in. Next, I removed the sleeve from the casters and pounded them into the holes with a hammer. The casters just pop in after that. Also, my niece found these casters incredibly fascinating. With that, the desk was done! This was a big project for me. Lots of pieces, lots of sheets of plywood, and lots of mistakes. Everything came together in the end, and the person I built the desk for loves it. At the end of the day, that's really all that matters. Hopefully you enjoyed this project, and please let me know what you think of these longer, two part builds. Would you rather have them as one long video? Let me know in the comments!